iFranchise Group CEO and expert franchise consultant Mark Siebert delivers the ultimate how-to guide to employing the greatest growth strategy ever—franchising. …and Learn Where You Can Buy the Complete Book Online! 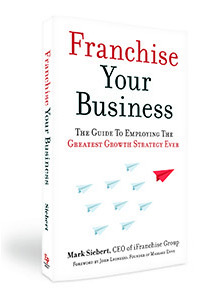 Request an excerpt from Mark Siebert's book, Franchise Your Business.